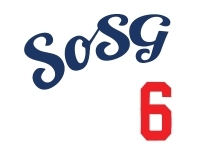 Sons of Steve Garvey: Puig: Perfectly Poised, Or Perilously Primed? It's funny, reading the post-game analyses of last night's victory and early-inning dust-up. Yasiel Puig had been hit in the left foot by an 88 mph Madison Bumgarner cutter. The two had a history, or at least four months' worth of bruised egos to nurse. Bumgarner doesn't like the way Puig celebrates home runs. Puig doesn't like the way Bumgarner yells at guys who celebrate homes runs in ways the pitcher doesn't like. So, on Tuesday, after he got hit, Puig glared over his shoulder as he sat in the dirt, Bumgarner yelled, "What are you looking at?" and all of a sudden Bumgarner's throwing his glove, Puig's yelling and lunging, players are jogging onto the field from all angles and the umpires are issuing warnings. Bad timing for the Dodgers. Whether you think Bumgarner overreacted, Puig overreacted or everybody reacted exactly as they should have, the last thing the Dodgers need is ejections, suspensions and ... well, who cares about fines? That's why Matt Kemp, suddenly showing leadership, was one of the first people to get between Puig and Bumgarner. That's why Don Mattingly grabbed Puig as quickly as he could get to him and began talking straight into his ear, no interpreter needed. "Do you think I understood?" Puig joked in Spanish later. That's why Mattingly got to Puig so quickly. There's too much at stake -- for both teams -- to risk somebody getting hurt in a brawl or some kind of chaos leading somewhere nobody needs to go right now. Yes, it's Giants-Dodgers, so you can expect a little hostility. But if they play good baseball for the next week or so, imagine Giants-Dodgers in the playoffs. Wouldn't that be fun? The teams could meet in the second round. "The best way to respond, really, is to play baseball. Do it with your bat, do it with your glove," was how Mattingly paraphrased the message. "I want to keep him in the game. I don't want him to get real emotional. I want him playing baseball. I needed him in the game today." It wasn't their emotions as much as their professionalism that seemed to carry the Dodgers to the big win on Tuesday. Justin Turner did what he always does with results he rarely gets. He had tough at-bats. A couple of them happened to end in a ball clearing the left-field fence. Zack Greinke tends to be brutally honest, which means he sometimes advises Mattingly to take him out of games if he's feeling tired after the 100-pitch mark. Tuesday, he said he felt great and advised Mattingly to leave him in the game for the eighth, which worked out great because the Dodgers' bullpen was gassed and Greinke cruised through the inning. The last two times Greinke threw at batters in games that turned to brawls, he ended up with a broken collarbone one time and suspensions to three of his teammates on the other occasion. Again, not the right timing for that kind of stuff. Greinke said neither the big-game atmosphere nor the simmering first-inning testosterone contributed to his good results over eight innings, during which the only blemish was Bumgarner's two-run home run. "Any time I try to do more than I'm capable of, it backfires. I just try to do the normal stuff, not try to get too over-amped," Greinke said. "I don't think extra emotion would matter in a series like this. Everyone's already excited. Maybe if it was the middle of the summer -- just another game and you're fighting to get your energy up." There is one Dodger besides Puig, however, who seems to thrive when emotions are running hot. Just a few minutes after everybody went back to their dugouts, Kemp sent a soaring blast over the center-field wall and Puig scored in front of him. A week earlier, Kemp had been seen yelling at Puig for not taking an extra base in Colorado. Mattingly called Kemp the Dodgers' "emotional leader." A year ago, they didn't have that heading into the playoffs. Now, Puig and Kemp can keep each other company while everybody else calmly goes about their business. One of the Dodgers' biggest postseason worries showed up Tuesday night, clearing benches, raising tempers, risking everything. As long as Yasiel Puig continues to struggle with his emotions, the Dodgers will awkwardly struggle to dodge their flames. The tempestuous outfielder allowed San Francisco Giants pitcher Madison Bumgarner to get into his head by hitting his foot Tuesday night in a first-inning plunking incident that nearly started a brawl. The Dodgers wound up with a 4-2 victory that pushed them to within one game of clinching their second consecutive National League West title, but the message from that early messy moment is one that could dog the Dodgers deep into October. Puig cannot be the sort of cornerstone this team craves until he begins leading with his head instead of his heart. As much as the Dodgers value him, they still can't really trust him, and that scares the heck out of them. Hmm. I guess that glass really is emptier than I thought, right? Or maybe Plaschke forgot about the Kemp HR. What the hell is Plaschke talking about? Since when has there been an issue with Puig's emotions, especially this season? He gets hit in the ankle by a guy who hates him immediately after another guy hits a homer and then he's mad. And there was the fight with Kemp. What other flames have we had to "awkwardly dodge"? The issue I had with Puig's emotions last night was that every other time he batted last night, he was so out of sorts trying to mash the ball to Reseda. Even Vin commented on Puig swinging at almost every pitch saying "He's in one of those moods." That's definitely something Puig will have to control in October. With only four games left, and no word from the Dodgers, it looks like there will be no Blogger Night this year. Sad. "Puig doesn't like the way Bumgarner yells at guys who celebrate homes runs in ways the pitcher doesn't like."